forums.drowtales.com • View topic - Fanart Stuffs. Board index ‹ Drowtales world ‹ Fanfics and Fanart ‹ Art Hall ‹ Fanart Stuffs. Oh boy, first time I've ever posted DT fanart here. I'm thinking if I do upload more I should keep it in this topic? It seems to be the done thing on this bit of the forum. I'd like to advise something for the coloring but as I don't think I'm either worthy enough for that, I'll just say as how I see it, that it's really good. And the nether effect looks great !! Question: You used a mouse, right ? HoneyBee wrote: It looks pretty good to me. The nether was done with this *really* awesome brush set I have (it's in my dA favourites). I highly recommend it. I was originally going to try a pyrefly-look for the nether, but I think this looks so much better. Oh I see. I thought it was mouse only because some of the shades aren't pointy enough. Nikkoru-san wrote: Mouse was only used for eyelash brushes (hand's not steady enough for drawing those yet) and the nether effect. Wait, "Paint tool" ?? >.> <.< What the H is the paint tool ? I know they call the Brush tool the Paintbrush tool in GIMP (I dunno if it is to avoid angry Adobe issues or to be different). Perhaps that was meant? Surprised you didn't use the tablet for those swirlies. I like the slight use of blue in the hair too. Pitdragon wrote: I know they call the Brush tool the Paintbrush tool in GIMP (I dunno if it is to avoid angry Adobe issues or to be different). Perhaps that was meant? I did try it, but most of my swirlies just didn't flow quite right when I did them by hand. I'm still trying to get used to my tablet, which means annoying breaks in lines that NEVER happen when I draw with a pencil. (With a pencil I can draw straight lines free hand ffs). In the end I despaired so much over the idea of leaving it unfinished that I opted to use a swirly brush effect thingie. And yes, I did use an eyelash brush. Pretty much the same reasoning as with the swirly nether, without the feel of paper it's annoyingly difficult. I'm hoping once I get used to it my control over the pen will get easier. EDIT: Bah, remind me to stop using my GIMP jargon >.< Yes, paint tool = brush. 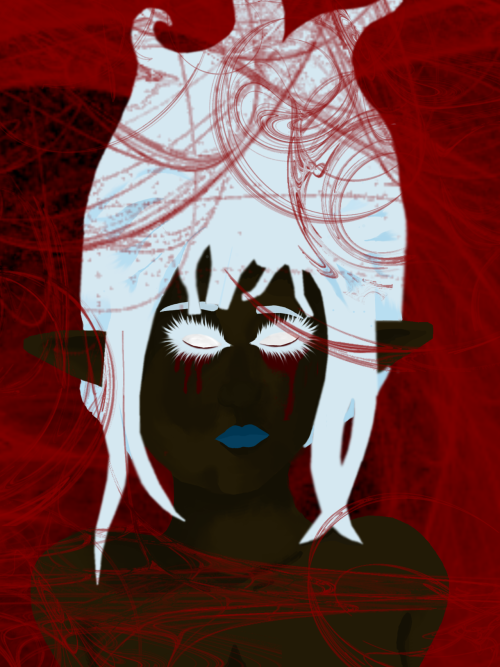 Blended the shadows on her skin, and added more nether to make her look entombed in it. Better? I kinda want to perfect this before I move on to something else.